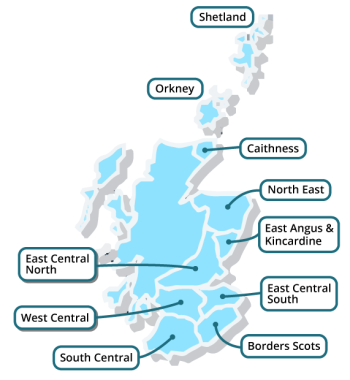 Scots is the collective name for Scottish dialects known also as ‘Doric’, ‘Lallans’ and ‘Scotch’ or by more local names such as ‘Buchan’, ‘Dundonian’, ‘Glesca’ or ‘Shetland’. Taken altogether, Scottish dialects are called the Scots language. The Scots language, within Scotland, consists of four main dialects known by the names (1) Insular, (2) Northern, (3) Central, and (4) Southern. These dialect regions were first defined and mapped back in the 1870's. Within each of the four main dialects there are also sub dialects which you can learn about in more detail by clicking on the relevant regions on the map opposite. These sub dialects exist because people who belong to a main dialect also have ways of speaking, such a words, phrases, or pronunciations, which are only found in a smaller area within a main dialect. And even within sub dialects it is also possible to find forms of speech used in very local areas, such as particular cities. So, to give one example, Central Scots, which is a main dialect, has a sub dialect called West Central Scots, and within West Central Scots the city of Glasgow has long had a distinct city dialect. This means that people who speak Glasgow city dialect are speaking a form of West Central Scots and also belong to the wider Central Scots region because they share many features in common with other speakers in that larger dialect region. We can then take this one step further, to a national scale, and say that people speaking Glasgow city dialect are Scots speakers because Central Scots is one of the main dialects of the Scots language as a whole.